Foothill Community Health Center is a small organization with a big purpose: to provide affordable health care services to low-income and under-served populations throughout San Jose, California. With patient visits doubling each year between 2010 and 2013, the need for Foothill’s services is dire. Foothill’s management knew that opening new clinics would help them meet this burgeoning demand, but the question of how to fund an expansion presented a major challenge. Assessing Options: Opening new health care centers would require renovating facilities and making significant expenditures on new equipment, furniture and fixtures. Although some state funding was available, the costs of expanding would certainly exceed that amount. Additionally, the team was concerned about investing in medical and technical equipment that would become outdated in a few years. Moreover, their resources to manage a complicated finance program were limited. The team needed a solution that would offer both attractive payment terms and administrative convenience – and they needed to find this solution fast. As they researched alternatives, they came into contact with First American Healthcare Finance … and things quickly fell into place. Although Foothill had no previous experience with leasing, they recognized that the finance package First American offered included everything Foothill would need for success. To start, First American’s favorable terms could be structured flexibly according to Foothill’s needs and preferences. CustomerConnect, First American’s cloud-based leasing program management tool, would allow Foothill to effortlessly manage all aspects of their account. They were also surprised with what they were able to lease, from IT equipment to medical and dental equipment and even furniture and building materials. And with the help of a dedicated project manager at First American, ordering the equipment and materials would be seamless. Best of all, at the end of the lease, Foothill could opt to either purchase or replace their leased equipment. Impressive Growth: Foothill made the decision to move forward with First American, and by 2015, Foothill had opened three new sites – an impressive feat for even the largest of health care organizations. As Foothill has grown, their impact on their community has grown as well. Take, for example, their clinic in Gilroy. Originally, the facility delivered medical services only; dental patients were referred to a clinic 30 minutes away – a difficult commute for the area’s indigent residents. 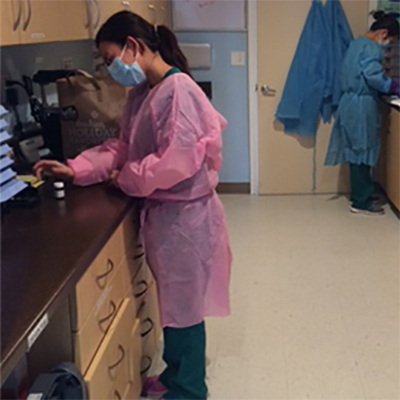 With financing from First American, Foothill was able to add dental services to the Gilroy clinic, generating an overwhelming community response. Dental visits nearly doubled in just 10 months, from 3,700 visits in January to almost 7,000 in October. Indeed, total patient volume in January 2015 alone exceeded all of 2010. Today, Foothill operates 14 sites throughout the greater San Jose region, and the entire team is energized and inspired by the opportunities this presents. "When it comes to customer service, on a scale of 1 to 10 – First American is a 12!"